I am so super excited to bring to you this review of the Ever After High School Spirit 2-pack! This was one of my most anticipated releases of the summer season! An Apple and Raven set?! Love it! Are you an Ever After High fan?! Then we’ve got the scoop for you! Toot’s Toys just got their shipment of the Ever After High School Spirit 2-pack with Raven Queen and Apple White. We’ve placed our order and are so looking forward to reviewing them for you when they get here next week! The website shows this 2-pack as being sold out, but make sure you sign up for updates, because they will be restocking this hot item! What else is coming soon? Next week we should see the release of two of Ever After High’s favorite rebels! Well…. is Darling a rebel? And Faybelle isn’t actually rebelling against anything… she just isn’t of Royalty. I hate the terminology that is used in Royals vs. Rebels. Sorry, off topic. If you want to ensure you don’t miss out on Faybelle or Darling, head over to Toot’s Toys to pre-order them. I can’t wait to do reviews for these dolls! I’ve been thinking of adding video reviews to my posts, as well as the still photos. What do you think? Would you like to see these dolls in action? Are are the stills enough for you? Leave me a comment below to let me know what YOU would like to see. OMG! How long has it been! I feel like we haven’t gotten new dolls in forever! I always hate the lull after Christmas. But fear not! It is now time for the new summer lines to start popping up! The first releases are the Monster High Gala Ghoulfriends dolls – Luna Mothews, Elle Eedee, and Mouscedes King. 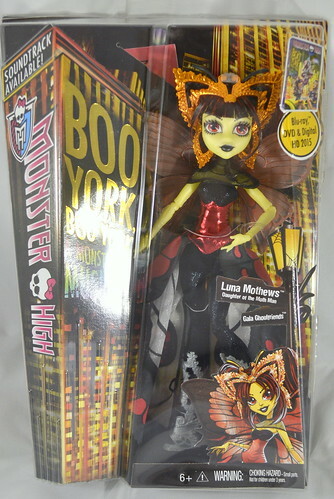 Our good friends at tootstoys.com hooked us up with a Luna Mothews doll to start our reviews!